For liturgical Christian churches, this is the season of Advent. While nary a Christmas hymn is sung until Christmas Eve, there are other traditions, including lighting one candle in an Advent wreath every Sunday before Christmas. This morning youth at Trinity Church posed by the wreath while waiting to rehearse the Christmas pageant. 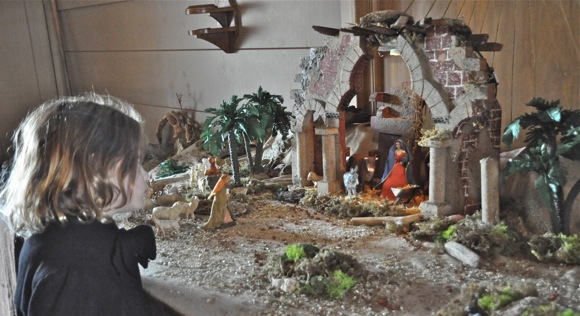 At the back of the church, a young girl inspected the Nativity scene where the Wise Men grow nearer each week. 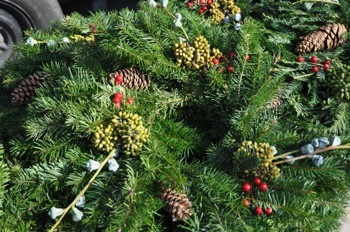 At the Farmers’s Market, which will be closed next Sunday (12/25) with some but not all vendors participating on New Years Day the following Sunday, Tony Cozzolino had brought over handmade wreaths from trees on his Half Moon Bay farm. 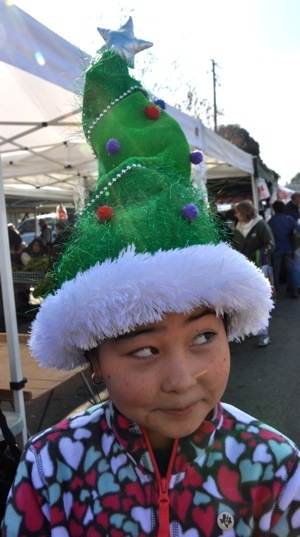 And a girl was displaying a good deal of seasonal whimsy with a bright green Christmas tree hat.